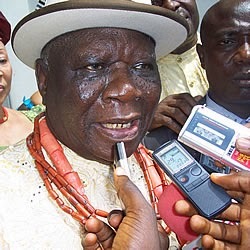 A former Minister of Information, Chief Edwin Clark, has pledged to work with the President -elect, Maj. Gen. Muhammadu Buhari (retd. ).He said he would support him the way he supported the late President, Alhaji Umaru Yar’Adua.Clark stated this in a congratulatory message he sent to Buhari, who defeated President Goodluck Jonathan in the March 28 presidential election. President Jonathan, who Clark supported passionately, was the presidential candidate of the ruling Peoples Democratic Party in the election. He said, “I congratulate you and reassure you that as you get to commence the process of peaceful transition and government, you will have my full support, as a man who strongly believes in the unity of Nigeria. Just as I supported our most respected late President, Umaru Yar’Adua and his successor, President Jonathan as long as you will at all times uphold the dignity of Nigeria and those things that bind us together as one united country. He said he was happy that the President conceded defeat, an action he said disappointed the nation’s detractors both within and outside the country. These unnamed enemies, he said, had thought that the result of the elections would not be accepted by any of the two major contestants and thereby create crisis for the country. If this had been done, he said the action would have satisfied those prophets of doom who he said felt there would be no more Nigeria after the 2015 general elections. Clark however insisted that every Nigerian must be treated equally and respected. He said the minorities of the South-South region had supported and worked with every government in Nigeria, and that they waited for 50 years before it pleased God to make one of them the ruler of the country.